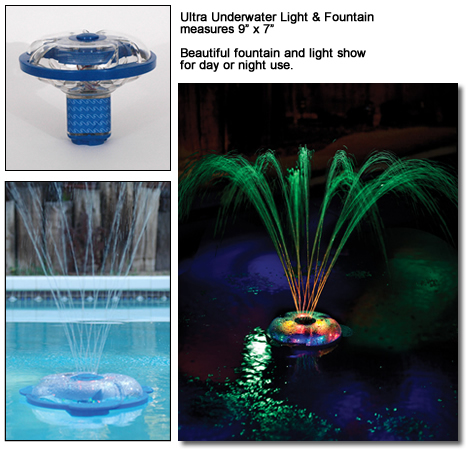 Enjoy color changing dancing water with this innovative fountain. Not only does the water dance and shimmer above the surface but a dramatic light show also is projected on your pool’s bottom. The light and fountain show is battery operated so there are no hose hook ups to restrict movement. The unit can be tethered or it will float freely around your pool. Water flow into the fountain causes the unit to spin, creating an even better light show. The Ultra Underwater Light & Fountain Show is the perfect pool party accessory! This units larger size gives an even better show than it’s smaller version. Unit requires 4 (D) batteries. The Ultra model measures 9.5" in diameter by 7.5" high.